This entry was posted in Campus Announcement and tagged forestry and wildlife sciences on January 29, 2013 by Wire Eagle. 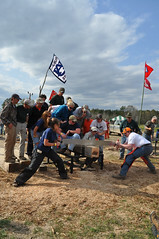 AUBURN UNIVERSITY – STIHL Timbersports is bringing its Collegiate Timbersports Championship Series and a professional regional qualifying event to Auburn March 15 as part of the 56th Annual Southern Forestry Conclave hosted by Auburn University’s School of Forestry and Wildlife Sciences. Fourteen college students from across the Southeast will compete in events based on traditional logging skills such as axe throwing, knife throwing, log rolling and wood cutting, with the winner earning a spot in the national collegiate competition. The professional lumberjack competition will be recorded for airing later on an ESPN-affiliated network. The four-day forestry conclave March 14-17 promotes cooperation, competition and professional ethics among forestry students. More than 300 forestry students from 14 universities will participate in technical events and traditional timbersports. One student from each university will compete in the Collegiate Timbersports Championship Series. The Collegiate Timbersports Championship Series will be held in the Cowboy Church of Lee County covered arena at 7600 U.S. Highway 280. Admission is $5. The forestry conclave events will have free admission and will take place at the Ag Heritage Park at 650 S. Donahue Drive.